7 Nights – 28 Dives. An exploratory expedition to the plummeting walls of Holmes, Bougainville and Osprey Reefs. It is highly suitable for recreational divers, as well as the rebreather and technical divers. Holmes – Large caverns decorated with colourful soft corals. Dozens of grey & silvertips at the shark attraction. Descend the spectacular Nonki Bommie thrusting up from 35m. Bougainville – Spectacular big fish action at Crystal Plateau. Explore the Dungeons & Dragons, labyrinth of caves and caverns. Dive the scattered remains of MV Antonio Tarabocchia. Osprey – Photograph the rare and ancient Osprey Nautilus. 3 shark attraction dives, 100’s of sharks. False Entrance – spectacular topography, visibility & pelagics. Witness the amazing Amphitheatre shark frenzy. tech dive specialist Prof. Simon Mitchell & Capt. T. Jackson. Ribbons Reef’s dives of outstanding marine biodiversity. 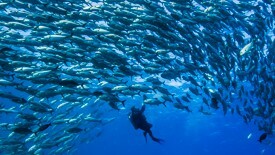 Spoilsport is Australia’s most awarded liveaboard. Enjoy sumptuous cuisine and a superb combination of diver conveniences, space & stability. Suitable for recreational divers plus rebreather and technical divers. Diving support includes nitrox, solo diving pony bottle rigs and rebreather service and consumables. Professor Simon Mitchell & Captain Trevor Jackson of the ‘Centaur’ fame. In 2002 Trevor & Simon rewrote history books when they dove to 178m for 5 hours to discover the truth about this famed hospital ship. This dive is still unparalleled in Australia. Several seminars on hyperbaric medicine & deep diving. Cruise 120 miles east to the deep clear Coral Sea territory. At ‘Amazing’ descend to a ‘fishbowl’ of shallow white sand with a myriad of marine life. The shark dive attracts grey reef & silvertip sharks. Spiral down ‘Nonki’ pinnacle through fish schools to caves festooned with soft corals at 35m. Flagship technical dive, Deep Sea Arcade is a spectacular 400 metre long overhanging cliff face that defies belief. In depths ranging from 55 to 75 metres, this site is suitable for advanced technical divers. Bring your camera and capture your own ‘cover shot’ of the stunning fan formations. Recreational divers will be able to dive the West Wall at North Horn. This isn’t deep reef, but it’s some of the world’s best tropical reefs and a must see on our itinerary. We’ll spend the last day exploring and enjoying the diversity of the Great Barrier Reef’s Ribbon Reefs, visiting some prime sites including Flare Point and Steve’s Bommie. Get your camera ready. Photo & Video Credits: Simon Mitchell, Damien Siviero, Mike Ball, Howard Womersley. No expedition scheduled at this stage. Please contact resv@mikeball.com for further information.